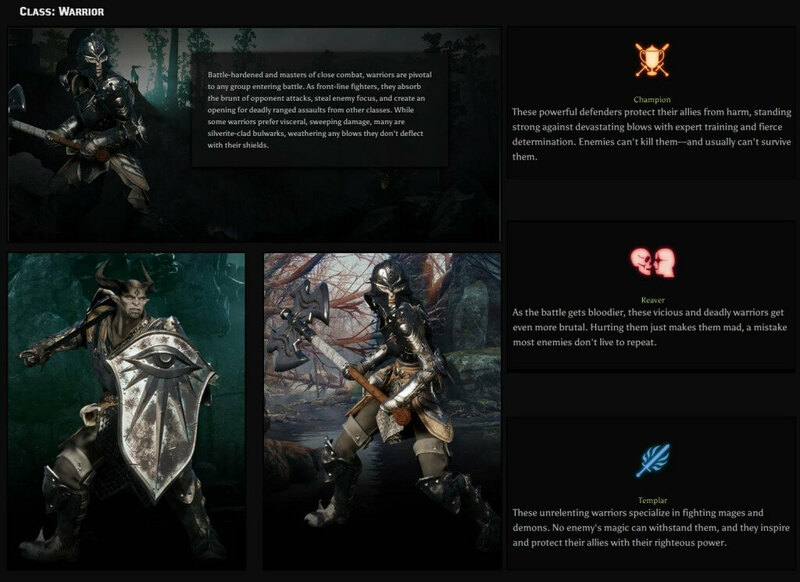 As standard for the Dragon Age franchise, players are able to choose from three classes – warrior, rogue, and mage – which are further broken down into three specializations each. Warriors are masters of dealing physical damage, and absorbing enemy attacks; mages are masters of casting spells, but are susceptible to physical damage. Rogues deal high physical damage, can employ either melee or ranged weapons like daggers or bows, wear medium armor, and are more mobile than other classes. Having said that, “Inquisition” throws in some innovations into the class design with specializations like the “Tempest” and the “Knight-Enchanter” which defy traditional class roles. 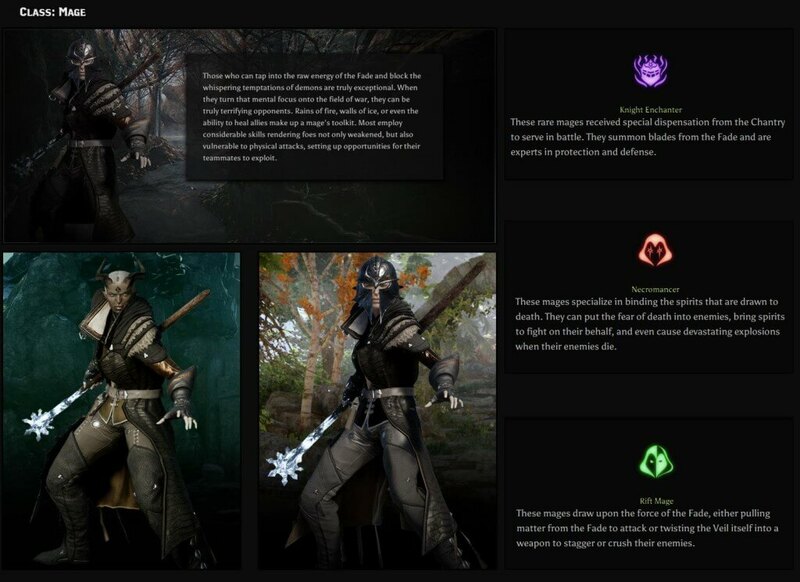 In Dragon Age: Inquisition, there are three possible specializations for warriors: Champion, Reaver, and Templar. Champions specialize at protecting their teammates and absorbing large amounts of damage. Reavers will be similar to Dragon Age 1 and 2 – warriors that are adept at dealing large amounts of damage through hurting themselves. The Templar specialization is also making a comeback – these are defensive warriors designed to counter magic users and demons. Rogues can specialize as Artificers, Assassins, or Tempests. The Artificer specialization has been revealed to be a master of traps, mines and other mechanisms, rather than directly engaging in fights. Assassins are similar to their previous incarnation in Dragon Age 1 and 2 – masters of dealing single-target damage and avoidance. Tempests mix elements of the mage and rogue classes together, using alchemy to generate magic-like effects. Mages can specialize as Knight-Enchanters, Necromancers, or Rift Mages. 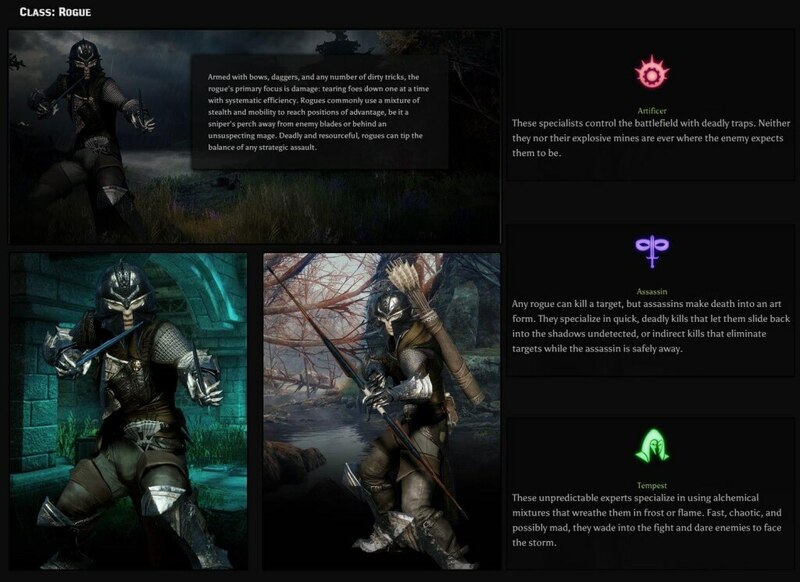 Knight-Enchanters have been revealed as a spec that combines magic with physical combat. These mages can thus fight with a style similar to warriors, but using magic as a source of their power rather than physical strength. Necromancers specialize in various death-oriented spells to strengthen themselves and weaken their enemies. Rift Mages specialize in using the power of the Fade to cast a wide array of spells.